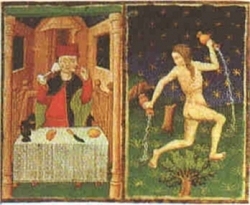 The Image of Aquarius from the Bedford Hours (ms. Add. 18850) created around 1425 CE. This medieval illustration has Ganymede, cup bearer to the gods, pouring water out of two jugs. This manuscript (calendar) is housed today in the British Museum (London). Compare it to the Golden Dawn Tarot card, the Star, which corresponds to this zodiac sign.